Today I made collard greens. I had a plate of them for dinner with corn muffins (yep, two) and sliced onion. It was just a simple honest southern meal and just delicious. Most people already have their favorite method or recipe for cooking collards, but I am always trying new and different ways to season greens and I wanted to try them today with a little apple cider vinegar added at the end of the cooking time. I am glad that I did because I think this is now my favorite way of preparing them, and I will definitely cook them this way again. 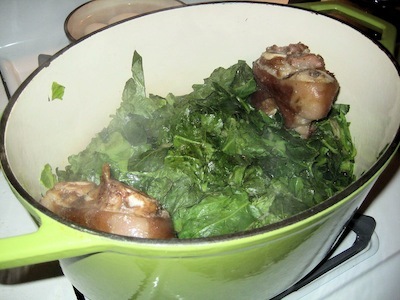 This was my preparation method- I simmered the greens with ham hocks in a large heavy Dutch oven for a long time over very low heat. In fact, the heat was so low that I had to keep checking the burner on my gas stove to make sure the burner had not gone out. It has happened before when I was low simmering cabbage. The Dutch oven that I used to cook my collards is very large. My two pounds of collard greens almost overflowed the pot. But, in only a short time, the collards had “melted” down to less than half the pot. If you do not have a pot large enough to hold all the collards at the beginning of the cooking time, then just put half in and let them “melt” and then add the other half shortly thereafter. I wanted to have some liquid or “pot likker” when the collards were done, so that is why I added the water, but notice I did not drown the collards in liquid while I was cooking them. I believe they are tenderer and have more flavor when you don't add a lot of liquid all at once. I hope you enjoy your greens as much as I did. Remove any large stems and discard from collard leaves. Cut or tear the collard leaves into pieces. Wash at least 3 times to remove any sand or grit. Prepare a large Dutch oven by spraying the bottom with cooking spray or add a small amount of vegetable oil. Place the Dutch oven on the burner and turn the heat to medium. Add the wet collards to the Dutch oven. Add ham hocks to the top of the collards, salt (I used about a teaspoon) and the sugar. Cover tightly, and turn the heat down to very low. There should be steam rising when you open the lid. After the collards have cooked down, add 1 chicken bouillon cube and 1 cup of water. Let them cook covered, until some of the liquid has cooked out. Then add the second cube and the second cup of water. The cooking time on a very low heat will be about 2 1/2 hours. Check for seasoning and add salt if needed. When the collards are tender, add 1 tablespoon apple cider vinegar, and stir well. Remove the ham hocks, take out any meat in the hocks, and add to the collards. Serves 4. Remember not to add too much salt because the liquid will cook down, even on low heat. Also, the chicken bouillon cubes have salt in them. You can always season later if you need to. Enjoy!